The recent trade war between the United States and China might be a result of President Trump’s businessman type diplomacy, in which he emphasises on the short-term profit of the United States more than the long-term strategy. The threat of imposing the tariff on China and sign the death sentence for China’s ZTE all seems to serve the purpose of saving jobs in America. Trump’s trade team may not pay attention to the reason why the goods imported from China are so cheap in the first place. 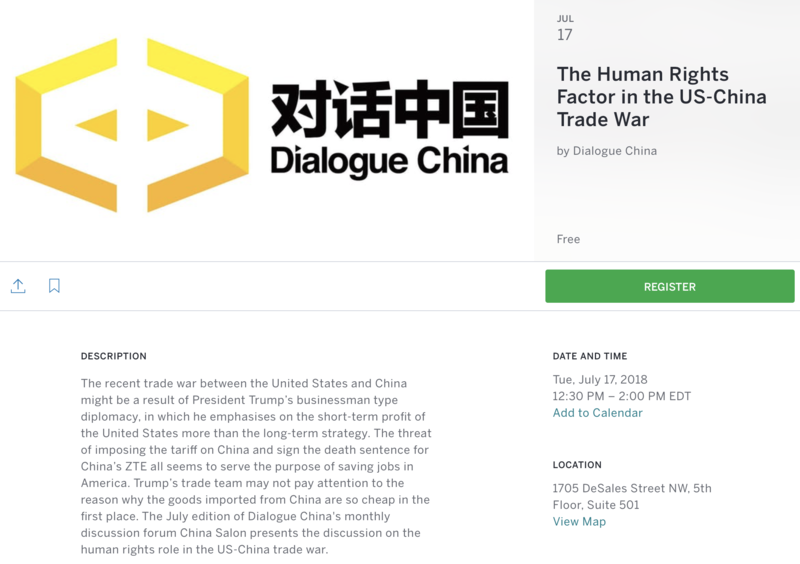 The July edition of Dialogue China’s monthly discussion forum China Salon presents the discussion on the human rights role in the US-China trade war. Sophie Richardson is the China director at Human Rights Watch. Dr. Richardson is the author of numerous articles on domestic Chinese political reform, democratization, and human rights in China. She has testified before the European Parliament and the US Senate and House of Representatives. Dr. Richardson is the author of China, Cambodia, and the Five Principles of Peaceful Coexistence, an in-depth examination of China’s foreign policy since 1954’s Geneva Conference, including rare interviews with policy makers. Hu Ping is a Chinese dissent in exile based in New York City. He is the editor in cheif of the magazine Beijing Spring. He is also a regular commentator of the Radio Free Asia. James Millward is a professor in the Department of History in the College and in the School of Foreign Service. He teaches a variety of classes on Chinese, Central Asian and world history at undergraduate and graduate levels. His research interests focus on China and Central Eurasia including Mongolia, Tibet and especially Xinjian.